Henry Moore is famous for his sculptures of people with bumpy forms and hollow spaces in their bodies. His sculptures also sometimes have holes right through them! As well as bumps and hollows he used flowing, abstract shapes in his sculptures. Look at this sculpture. It is of a figure lying down. Can you see its head? What about its knees? Where's its stomach? There's a hole where its stomach should be! Most of his sculptures are female figures, some are families and some just faces. Henry Moore was born in Castleford, Yorkshire, England in 1898. He was a teacher and was in the army before going to Leeds School of Art to learn to become a sculptor. He was inspired by nature. He sketched the hills near where he grew up and collected interesting stones, animal bones and tree roots on his regular walks in the countryside. He used these bumpy, twisted natural forms to inspire his sculptures. Can you see the inspiration of nature in his sculptures? During World War II, he was commissioned by the War Artists Advisory Committee to make drawings of people in London using underground stations as bomb shelters. The scratchy dark drawings powerfully capture the feelings of anxiety that people must have felt. 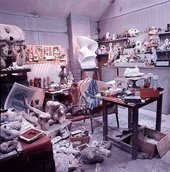 Henry Moore's career spanned over fifty years that's a lot of sculptures! He died in 1986 and was buried only a few hundred yards from his home at St Thomas's Church in Perry Green. Henry Moore is very famous for his sculptures, but he also made sketches in the London Underground during World War II, when the tube stations were used as bomb shelters. But how did he achieve the spooky effect of the figures rising out of the darkness? With cheap wax crayons and watercolour paint! 'I hit upon this technique by accident, sometime before the war when doing a drawing to amuse a young niece of mine. I used some of the cheap wax crayons (which she had bought from Woolworth’s) in combination with a wash of water-colour, and found, of course, that the water-colour did not ‘take’ on the wax, but only on the background. I found also that if you use a light-coloured or even white wax crayon, then a dark depth of background can easily be produced by painting with dark water-colour over the whole sheet of paper'. Can you see where Moore has used light-coloured crayon and dark watercolours to create the ghostly figure of Woman Seated in the Underground (1941)? The ink flows over the wax and soaks into the paper around it, leaving the light colours behind. Why not have a go yourself? You could even try and make yourself into a Henry Moore statue! Check out this artist's performance at Tate Britain!